Benedictine Father Gregory Chamberlin, a monk of Saint Meinrad Archabbey in St. Meinrad, died on June 10 in the monastery infirmary. He was 75 and a jubilarian of profession of vows as a monk and priestly ordination. The Office of the Dead was prayed for him on June 12. Following a Mass of Christian Burial on June 13 in the Archabbey Church of Our Lady of Einsiedeln in St. Meinrad, he was buried in the Archabbey Cemetery. Throughout 54 years of monastic life and 49 years of priestly life and ministry, Father Gregory held many positions in the monastic community at Saint Meinrad, its seminary and in parishes in the Archdiocese of Indianapolis and the Evansville, Ind., and Memphis, Tenn., dioceses. Father Gregory was born on Oct. 12, 1938, in Indianapolis. He received the name David Andrew at his baptism. 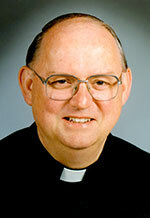 After growing up at St. Andrew the Apostle Parish and the former St. Francis de Sales Parish, both in Indianapolis, he entered the minor seminary at Saint Meinrad in 1952. He entered the novitiate in the monastery in 1958, made his first profession of vows on Aug. 15, 1959, and was ordained a priest on May 2, 1965. Father Gregory taught French at the former Saint Meinrad College for 25 years, having earned a master’s degree in French at Middlebury College in Middlebury, Vt., in 1973. In addition to teaching French, Father Gregory served in the college as assistant dean of students, dean of students and vice rector. He later worked in Saint Meinrad’s development office, including as its alumni director. In the mid-1980s, he served for two terms on the archdiocesan Council of Priests. In 1987, he served for six months as administrator of St. Michael Parish in Cannelton and St. Pius V Parish in Troy. After serving in parish ministry in other parishes in the Evansville and Memphis dioceses, Father Gregory began service as pastor at St. Benedict Parish in Evansville in 1991, a ministry he would continue until his retirement in 2013 for health reasons. During that time, St. Benedict Church was named cathedral of the Evansville Diocese. In 2011, Father Gregory received a Distinguished Pastor Award from the National Catholic Educational Association.